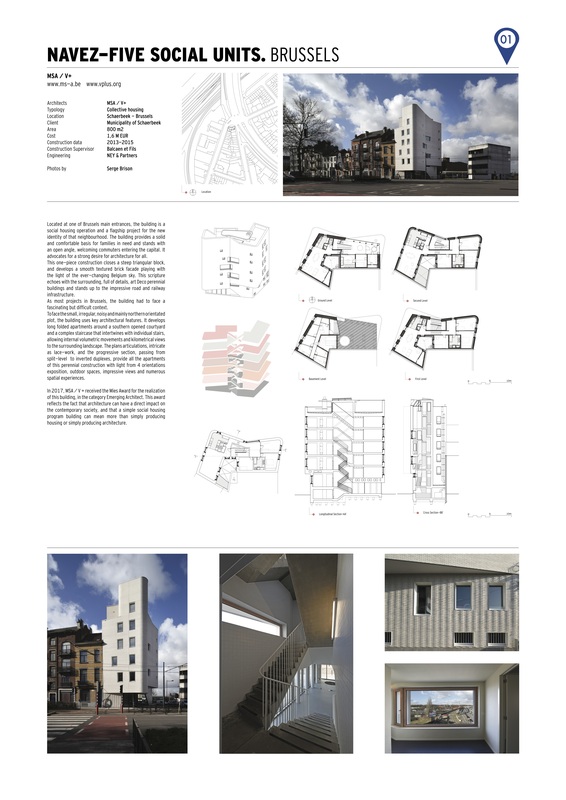 Located at one of Brussels main entrances, the building is a social housing operation and a flagship project for the new identity of that neighbourhood. The building provides a solid and comfortable basis for families in need and stands with an open angle, welcoming commuters entering the capital. It advocates for a strong desire for architecture for all. This one-piece construction closes a steep triangular block, and develops a smooth textured brick facade playing with the light of the ever-changing Belgium sky. This scripture echoes with the surrounding, full of details, art Deco perennial buildings and stands up to the impressive road and railway infrastructure. As most projects in Brussels, the building had to face a fascinating but difficult context. To face the small, irregular, noisy and mainly northern orientated plot, the building uses key architectural features. It develops long folded apartments around a southern opened courtyard and a complex staircase that intertwines with individual stairs, allowing internal volumetric movements and kilometrical views to the surrounding landscape. The plans articulations, intricate as lace-work, and the progressive section, passing from split-level to inverted duplexes, provide all the apartments of this perennial construction with light from 4 orientations exposition, outdoor spaces, impressive views and numerous spatial experiences. In 2017, MSA / V + received the Mies Award for the realization of this building, in the category Emerging Architect. This award reflects the fact that architecture can have a direct impact on the contemporary society, and that a simple social housing program building can mean more than simply producing housing or simply producing architecture.